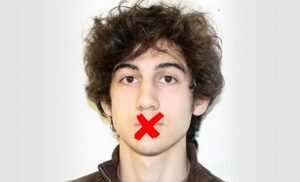 The fact that Dzhokhar Tsarnaev has not yet spoken in his own defense may be less about national security and more about muzzling the truth. Dzhokhar Tsarnaev was raised to take the direction of the most powerful adult in his life, his attorneys say—and now all those powerful adults seem to be telling the 21-year-old to sit down and shut up. And to make sure he shuts up, they have been holding him under Special Administrative Measures (SAMs) that severely restrict any contact with the outside world. This is presumably to prevent him from communicating to the outside world any plans that could result in death or bodily harm. But is muzzling the defendant really in the interest of national security—or in the interest of the national security apparatuses? For the two years since the April 15, 2013, Boston Marathon bombings, WhoWhatWhy has documented the myriad ways that arms of the US government have contradicted its claim that the two Tsarnaev brothers were “lone wolves” motivated by ideology, with the feds consistently seeking to suppress information that could shed light on the bombings. This includes keeping the defendant totally mute. To date, we have not heard a word from him—and now, even after he was convicted, we still have not heard a peep. This is in part, too, due to the strategy his own attorneys employed. Seeing the impossibility of their own investigators getting to the bottom of the many mysteries in the case, they threw in the towel, claiming their client “did it,” and blamed the influence of his dead older brother, Tamerlan, in hopes of achieving the dubious victory of a life sentence without parole. 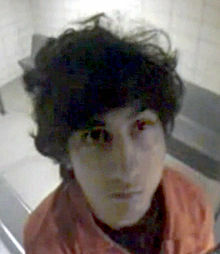 Now, in the “penalty phase,” while he awaits word of whether he will face the death penalty, Tsarnaev sits there, mute and virtually expressionless, causing some to wonder just how bad were the injuries he sustained when police fired upwards of 100 bullets into the boat where he was hiding, or if he might be heavily medicated. And yet he seemed particularly astute during the defense’s presentation of its case during the guilt phase. He frequently spoke with his attorneys, and wrote Post-it notes to them as they were examining witnesses. If he wasn’t incapacitated, why wouldn’t his legal team allow him to speak in his own defense? Does Dzhokhar Tsarnaev want to testify? If so, why has he been stopped from doing so? What would he have had to lose? Do his lawyers think the prosecution would provoke him into behaving in a manner that would harden the jury against him even more? If he is the victim of more complex circumstances, why not give him a chance to say so? And if he is a terrorist, why would he not want to publicize his cause and have his lawyers show photos of dead Muslim children killed by American drone strikes? Why bomb a public event if you’re not making a political statement? The defense’s strategic decision not to help us learn more about what the Tsarnaev brothers were up to—and why—seems a strange one. But then so does the constant invocation of “national security” by government agencies in repeatedly blocking disclosures and sealing a plethora of motions. The paradox is that we’ve been repeatedly told that this plot was about nothing larger than two misguided young people operating alone. But as our reports have shown, the FBI had a prior relationship with Tamerlan Tsarnaev, sought to recruit others in his orbit as plot infiltrators, and, bizarrely, failed to monitor his doings and international travel even after a warning from Russian intelligence. Somehow, all of this has been lost or buried. It barely came up in the trial, perhaps because of the strategy: blame it all on the elder brother, then assure that virtually nothing about the elder brother can be deemed germane, because he is dead and not on trial. Unapologetic Killer or Pliant Follower? Rather tellingly, the person who argued that point might just be one of the most powerful adults in the convicted Boston Marathon bomber’s life: his attorney, David Bruck. Bruck, together with Tsarnaev’s other lead attorneys Judy Clark and appointed federal defender Miriam Conrad, hold Tsarnaev’s life in their hands as they attempt to show that their client was really nothing more than a “lost teenager” without any real motivation to bomb anything. They are arguing, during the sentencing phase of the trial, that Tsarnaev would never have committed this crime had he not taken direction from his older brother, Tamerlan. Remaining rigidly locked into this approach, they have sought to demonstrate their cooperation with every point asserted by the government. If Tsarnaev is given life in prison, his lawyer has said that he would be completely cut off from the outside world. We get a rare look at the inner-workings of his trial team’s strategy in a transcript released by the court during the sentencing phase. The transcript was of a lobby conference to which the jury was not privy. The transcript reveals that Tsarnaev’s attorneys were so determined to show their cooperation and commitment to ensuring that their client would never again pose a risk that they agreed to any conditions of confinement—including his total muzzling. In his opening argument to the penalty phase, Bruck virtually guaranteed that should the jury send him to prison for the rest of his life, Tsarnaev would live a lifetime of pained silence in retribution for what he did. To be sure, the defense likely hopes that promising Tsarnaev will never cause further anguish to the victims will be an effective bargaining chip. But there seems to be more to it. Best for whom that Tsarnaev be silenced? The law was established to prevent presumably dangerous inmates—those accused of terrorism, espionage, mob or gang activity—from communicating to the outside world any plans that could result in death or bodily harm. Tsarnaev will most likely go to a federal supermax prison—whether he is given life without parole or the death penalty—and be kept in solitary confinement. As the measures currently stand, he would never be able to tell his version of events, communicate the reason behind his murderous rampage or cry out that he was framed, coerced, or caught up in something larger. Assuming he was, as convicted, involved in a plot to harm large numbers of people, it would seem to be in the interest of public safety to learn something from and about those who would commit such acts. And if this story is much more complicated—as suggested by the anomalies WhoWhatWhy has uncovered—then it is in the rather urgent interests of a democracy increasingly beset by an unaccountable security state to hear directly from Dzhokhar Tsarnaev. There are 55 comments Our Comment Policy: Keep it civilized, keep it relevant, keep it clear, keep it short. Please do not post links or promotional material. We reserve the right to edit and to delete comments where necessary.